2018 has been a record breaking year for The Big Indie Pitch, one in which our sister competition The PC Indie Pitch has only gone from strength to strength too. In fact, this year we’ve taken the PC Indie Pitch to 8 different locations, and seen more than 100 developers showcase their latest games in the competition. However, whilst the nights may already be drawing to a close, there was one last stop on the PC Indie Pitch tour of 2018, and it was a big one, as we took to the show floor of South Korea’s leading game conference G-STAR to highlight all of the amazing indie developers from the region. 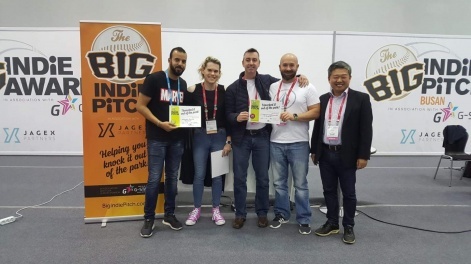 This well attended pitch saw a vast array of talented developers battle it out to be crowned Asia’s first ever PC Indie Pitch champion, a title that was ultimately awarded to the Outworld Battlegrounds, a battle royale title developed by Hit Lab. For those not in the know, the PC Indie Pitch is a regular event run by the makers of PCGamesInsider.biz. It gives indie developers the chance to pitch their games to industry experts and journalists in a speed-dating-style format. Teams get the opportunity to get valuable feedback on their games, as well as win great prizes such as promotional packages and the coveted PC Indie Pitch bat. Of course, Outworld Battlegrounds as you already know was the winner, but we always award prizes for the top three. So read on to not only find out more about Outworld Battlegrounds, but also our second and third place prize winners too. Taking a slightly different approach to the battle royale genre, Outworld Battlegrounds is a 2D, top-down mass shooter, one built in a pixel art style and set in a sci-fi universe. The change in camera viewpoint isn’t the only twist on this incredibly popular genre though, as developer Hit Lab has also tweaked the gameplay so that there is more of a focus on quick, tense, skill-based matches, something highlighted thanks to the gameplay’s limited line of sight. Overall thanks to these unique twists, Outworld Battlegrounds looks set to offer those hungry for a more faster, refined and retro infused battle royale experience something to definitely watch out for. Drawing primarily from the figures, traditions, and landmarks of Filipino culture and history as inspiration, Bayani is one on one indie fighting game that offers players a stylish and tactical take on this hugely popular genre. Each character as always will be outfitted with their own unique array of attacks, and battles will take place across a variety of different battlefields. Finally, developer Ranida Games also plans to ofer an in depth storyline that utilises these legends and traditions of the Philippines, whilst placing this within an alternate timeline where anything can happen. 3rd Place – Veterans Online by PolysmartOur third place finalist from The PC Indie Pitch at Pocket Gamer Connects Helsinki 18 returned once again, and this time also took the the third place prize once again with Veterans Online. Veterans Online is the first title from independent developer Nuke Cockroach, and is a free-to-play MOBA that uses an isometric view and focuses on online PvP battles that can be played either solo or as a team. Alongside this, Veterans Online also offers a stylish cartoon inspired look, character customisation, and multiple gameplay modes.